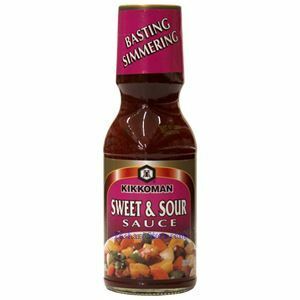 Poured out of the bottle, Kikkoman Sweet & Sour Sauce offers a delicious shortcut preparation for one of the most popular Chinese dishes, sweet and sour pork. Naturally brewed Kikkoman Soy Sauce, tomato paste, pineapple, onion, green bell pepper, garlic and spicy red pepper are blended together to give this sauce a truly Asian taste. A perfect balance of tanginess and sweetness, it can be used to zest up American braised, broiled and roasted specialties. In addition, Sweet and Sour Sauce makes an excellent dipping sauce for appetizers and finger foods, such as fried won tons and chicken wings. WATER, SUGAR, NATURALLY BREWED SOY SAUCE (WATER, WHEAT, SOYBEANS, SALT), VINEGAR, MODIFIED FOOD STARCH, TOMATOES PINEAPPLE CONCENTRATE, ONION POWDER, CARMINE (COLOR), GREEN BELL PEPPER FLAKES, SODIUM BENZOATE; LESS THAN 1/10 OF 1% AS A PRESERVATIVE, CITRIC ACID, GARLIC POWDER, DISODIUM INOSINATE, DISODIUM GUANYLATE, RED PEPPER.